On Feb. 14, a 19-year-old armed with an AR-15 semi-automatic rifle killed 17 students at Marjory Stoneman Douglas High School in Parkland, Fla. As family, friends and classmates grieve the ones they lost, they've also simultaneously rallied together to create a movement demanding gun control in the US. Cameron Kasky, a 17-year-old Majory Stoneman Douglas student, came up with the name "Never Again" for the movement. 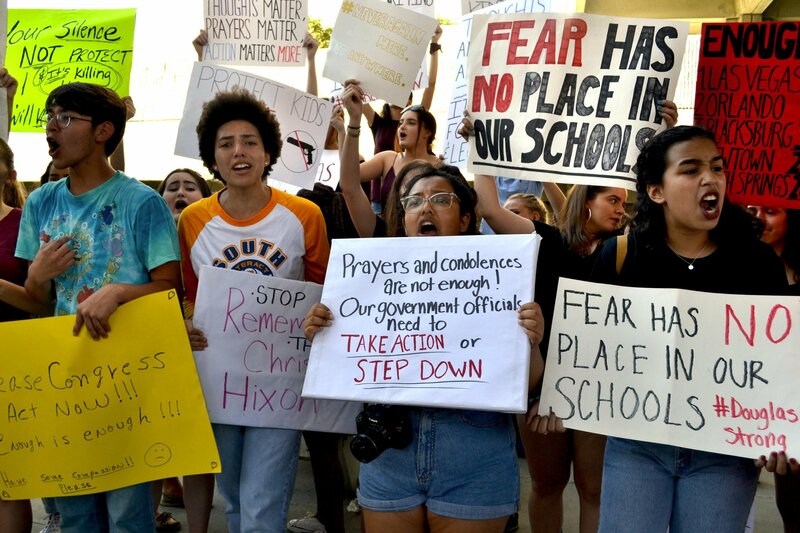 He, along with other students from the school, have spent numerous hours with reporters to share the movement's goal: stricter background checks for gun buyers. "We can't ignore the issues of gun control that this tragedy raises. And so, I'm asking—no, demanding—we take action now," Cameron said in an op-ed for CNN. In a separate interview for the outlet, he said, "I'm not trying to take everybody's guns away, but there was a 19-year-old who legally bought an AR-15...and I think there need to be a lot more regulations put on guns and it needs to be a lot harder to get them." The creators of Never Again are fully aware of the normal timeline surrounding gun violence tragedies: Typically, major media attention will be devoted to the event, but as the dust begins to settle, news outlets often move on to the next story. The students smartly and quickly rallied to make themselves the voice of all those hurt by gun violence. And, to keep the focus on their message, they've begun planning rallies, speeches and marches spread out over upcoming months. Key events include a 17-minute walkout organized by the Women's March on March 14, the March for Our Lives march on D.C. (and other major cities) on March 24, and the #NationalSchoolWalkout on April 20. One student, Emma Gonzalez, gave an impassioned speech at an anti-gun rally in Fort Lauderdale, Fla., two days after the shooting, on Friday, Feb. 16 (watch a clip below). The group is also organizing a trip to Tallahassee to rally and speak to government officials about gun control and reforming gun laws. As of Feb. 14, 2018, there have been 30 mass shootings in the United States this year alone—including the one in Parkland. From 2014 to 2017, there were 1,333 mass shootings in America. With the upcoming events, the movement hopes to have a great affect upon the 2018 midterm election in November, in which congressmen and women will run for reelection. Their hope is to get National Rifle Association-supported politicians out of office. What that means: There are several congressional representatives from Florida who accepted money from the N.R.A., including Sen. Marco Rubio and Rep. Brian Mast, for their election campaigns in 2016. Essentially, these leaders accepted money from an organization that advocates for gun rights and opposes most new gun control legislation. Check out the #NeverAgain movement on Twitter, and let us know in the comments if you plan on attending any of the upcoming marches. ICYMI: JoJo Siwa is performing at the second annual SlimeFest!